Annual or biennial herb 0.5 - 2 m tall Stem: coarse, erect, unbranched or sometimes freely branching. If the stem is broken or cut, it exudes milky sap. Leaves: alternate, stalked, toothed, more than 1 cm wide, longer than wide, with a slender tip, and a tapering base, which sometimes continues down onto the slightly winged stalk. Inflorescence: of elongate spikes up to 60 cm long, with flowers clustered (or single) in the axils of bracts. Lower bracts leaf-like, but upper ones reduced. 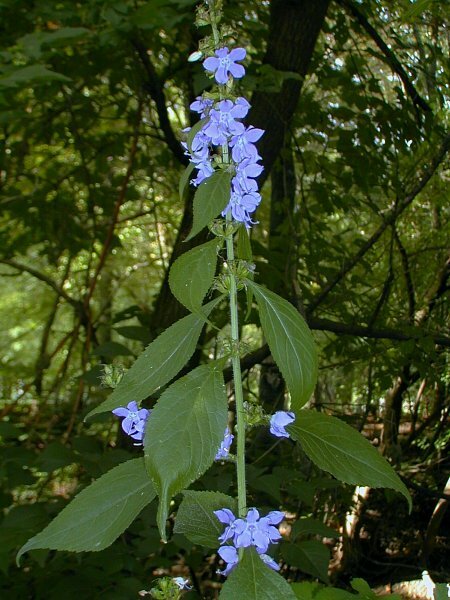 Flowers: blue, 2 - 2.5 cm wide, radially symmetric, with five spreading lobes. Sepals: five, but fused at base, then separating into 5 - 10 mm long, linear, spreading lobes. Petals: five, but fused into a tube at the base, then separating into spreading, somewhat egg-shaped lobes. The petal tube elongates with age. Stamens: five, with filaments attached to the very base of the petal tube, and the anthers extending beyond the petal lobes. Pistil: with a single, three-chambered, inferior ovary; and a single, long, down-curved style, which curves upward before ending in a three-lobed stigma. Fruit: a many-seeded, three-chambered, 7 - 12 mm long, almost cylinder-shaped, hairless capsule, which opens by round pores located near the top. Similar species: Campanula americana is superficially similar to the non-native, European species, C. rapunculoides, but that species has non-spreading flower lobes, capsule pores located near the base, and non-tapered, often heart-shaped leaf bases with no leaf tissue continuing onto the leaf stalks. All other species of Campanula are smaller and more delicate with bell-shaped or funnel-shaped flowers. Habitat and ecology: Common in rich woodlands, shaded floodplains or moist borders, usually preferring rich moist soil and somewhat open or even semi-disturbed areas such as trails, edges of fields, and railroads. Notes: This is the only species of Campanula with wide-spreading petals, a petal tube which elongates in age, stamens which reach up and over the petals, pantoporate pollen (pores spread over the surface, possibly in a regular pattern), and a capsule which opens by subapical valves. Accordingly, this species has often been separated into its own genus, Campanulastrum. In moist, rich woods throughout the state. It is easy to grow in cultivation and, if the ground is bare when it ripens its seed, it sows itself abundantly. In the spring hundreds of plants will grow and these can be thinned out and the surplus be used for "greens."